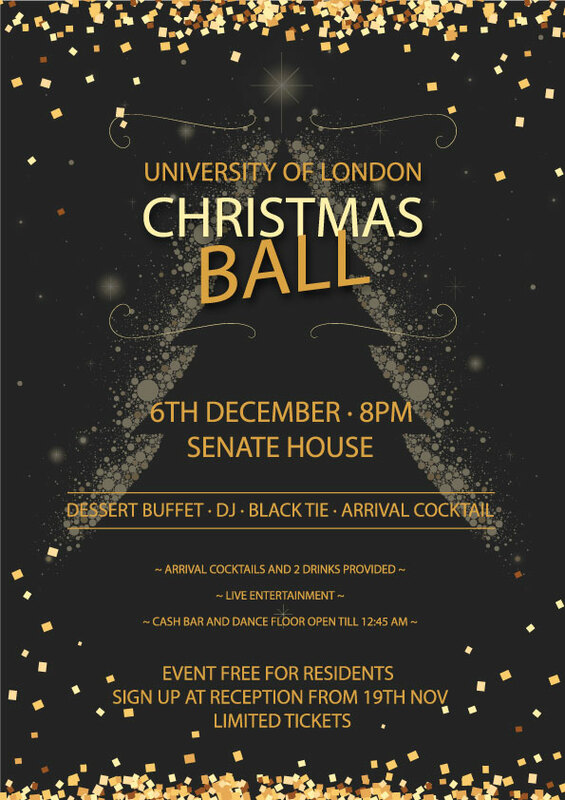 The first annual University of London Christmas Ball will be held in Senate House on December 6th from 8pm onwards. Senate House will be transformed into a black and gold winter wonderland which will include a dance floor with a glamorous cocktail reception, followed by a dessert buffet and finger food with live entertainment throughout including a DJ who comes plays until the early hours of the morning. 4) Access to the evening's festivities (casino games, live performances, DJ) , amazing festive decoration, cash bar operating till 12.45am and much more! The dress code for the event is Black Tie/ Evening Dress. This is an event not to be missed, so join us in celebrating the beginning of the festive season the right way. Sign up for the tickets will start on Monday 19th November, 8am at reception. There are LIMITED TICKETS AVAILABLE per Hall so hurry up and sign to get your free ticket.